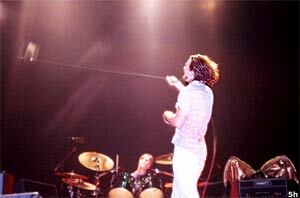 So many photos are surfacing from Pearl Jam's tour ... it is hard to select one to feature here. When our friend Dan Grenough told us he'd taken rolls of film from front and center at the opener at Virginia Beach, we got excited. This photo captures a tiny slice from the August 3 show - Porch - now accented with Ed's microphone swings in beat with Matt's drumming. 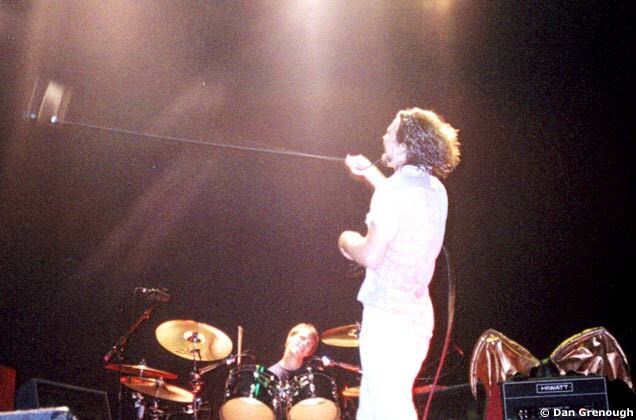 We'd heard about "Daltrey-style" mic swings, but this is HUGE! Be sure to check out the rest of Dan's photos. He has some awesome shots [including (possibly) the butterfly that made an appearance that night]. Thanks, Dan!